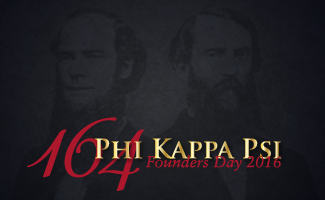 On February 19, 2016, the Phi Kappa Psi Fraternity turns 164 years old. Please consider celebrating the big day by attending a Founders Day event in your area. Founders Day exists as a perfect annual opportunity to get together with your brothers, talk about memories, connect with your local Alumni Association/Chapter, and have a great time in the process. Cocktails at 11:00am, followed by lunch at noon. Hear reports from the chapters at AL Alpha, AL Beta, and AL Gamma. All alumni, guests, and undergraduates in the area are welcome. Speaker former Bama football great Todd Bates.